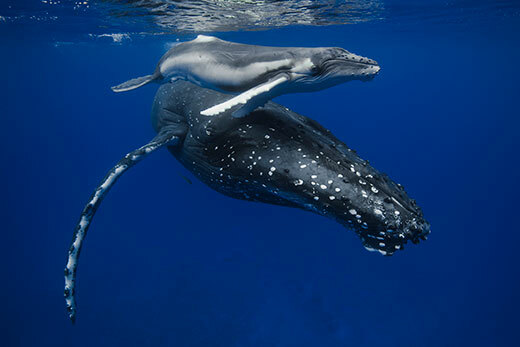 13 years in Tonga photographing the amazing Humpbacks and this was one of the best seasons yet. In August the water surprisingly cooler and there were a lot more whales closer inside the islands. On at least 3 occasions the whales were right insight the Harbour which happens rarely. Maybe once every 4-5 years. For anyone that has never visited the south Pacific, Tonga is one of those untouched places and still pristine in many respects, clear water, beautiful reefs, stunning caves and the added bonus of a multitude of friendly whales. This year we started the Tongan Fluke Collective, which encourages visiting photographers to donate Fluke shots to help ID the different individual whales that come to Tonga each year. You can find out more about the program here: https://www.facebook.com/groups/tonganflukecollective – Anyway we will be running a number of Photographic tours in the next year or so to various destinations, so stay tuned. We had this amazing moment with a new born mother and calf last year in Tonga that words cannot describe, this calf was less than a day old, no scratches, marks and still remnants of umbilical cord. it was such a special moment. It is one of thje images showcased at the Beneath the Sea awards this year. We had an amazing season in Tonga this year filled with a multitude of mothers and calves and encounters with a number of creatures that were an unexpected surprise. whether we were swimming with Whales, Manta Rays, Blue Marlin, Leopard sharks and even a 15 metre long creature from the deep. Some amazing days on the water and spectacular evenings with all our guests. We are already looking forward to next season! 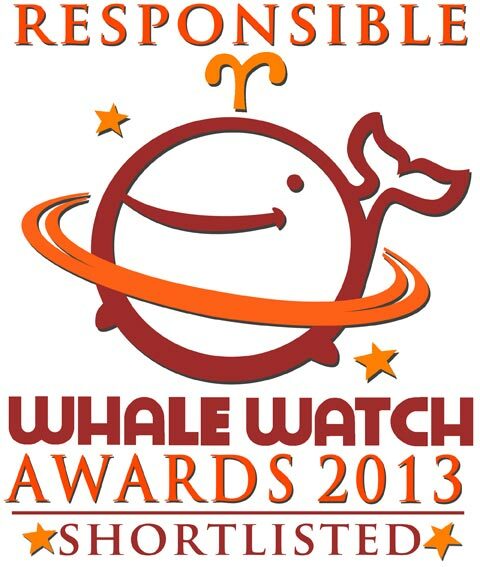 We have been shortlisted for the 2013 Responsible Whale Watch Awards. This is a great honour and we are proud to be recognised for our responsible operation with these amazing creatures. 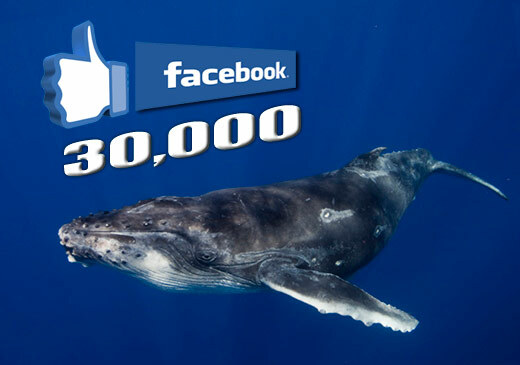 We have hit a social media milestone today reaching 30,000 fans on our Facebook Page. Thanks to all those loyal followers and passionate whale enthusiasts. As a thankyou for all your support we are giving away some limited release prints of some of these amazing whales. visit our Facebook Page for your chance to own one of these Prints. On occasion I receive requests from artists who have kindly mentioned that my images of the Humpbacks have inspired them and they would like to create or reproduce the subject in their own unique style. Someone who has done this is Renata Bruynzeel, a local Wollongong artist with a phenomenal talent for creating beautiful wildlife art. 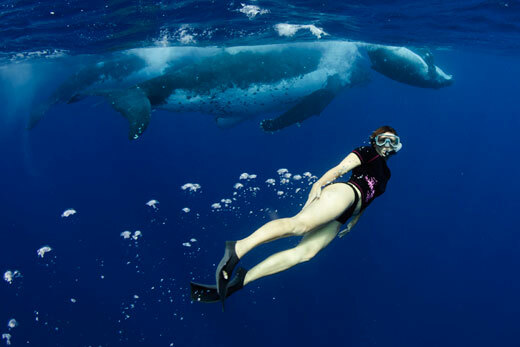 Renata has been to Tonga on several occasions spending time in the water with the Humpbacks. 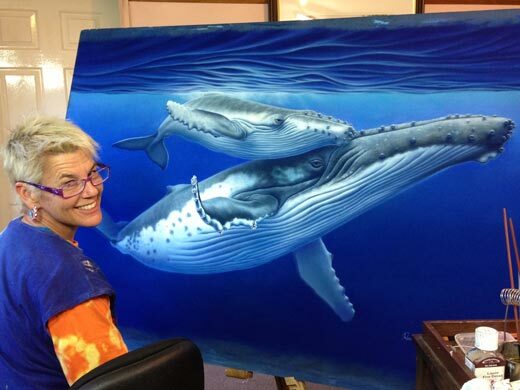 She has a passion for these amazing whales which is indicative of the beautifully crafted artwork you see below. You never know how an artist will interpret a photographic piece or what to expect, which is the part I find exciting. But as you can see, the end result is spectacular as Renata brings these amazing creatures to life and captures the emotion and passion that she has for all wildlife. She truly captures the wonderful life-like effects and the awesome beauty and spirit of these gentle giants in their natural environment. 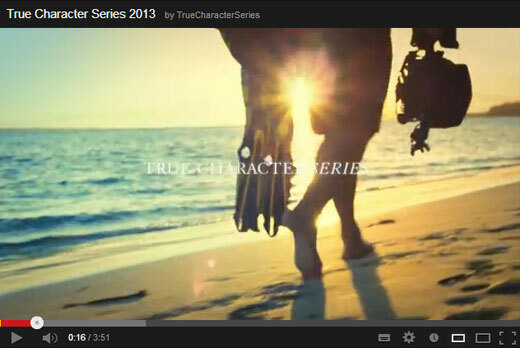 The Jacobs Creek, True Character Series is a collection of stories about inspirational people that have stayed true to dreams, through their passions. I was selected along with several other inspirational, funny, interesting characters from around the world to talk about my passion for whales. IFAW have launched their “”We’re for Whales” photographic exhibition at Customs House in Sydney. 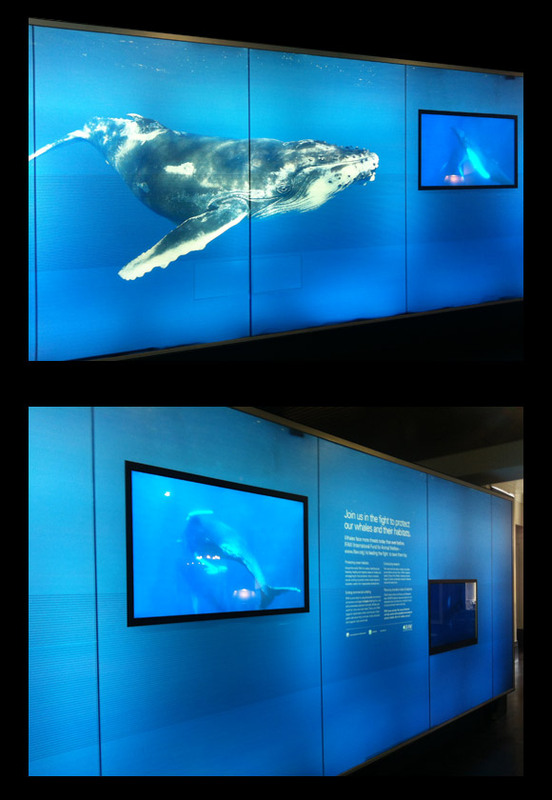 A number of our phots of Humpback Whales feature on the massive digital wall on the ground level and throughout the exhibition. 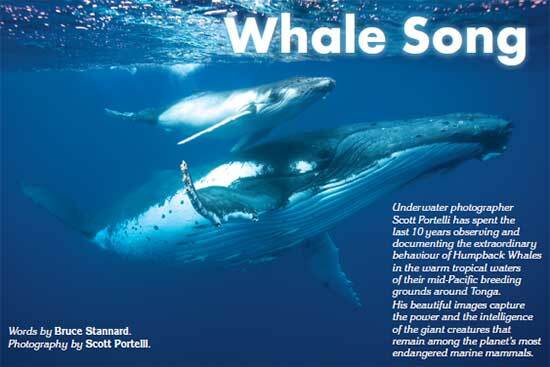 If you are in Sydney it is worth going to have a look at the exhibition and support the fight to protect our whales. Although we will never know with any certainty just how many Humpbacks swam the world’s oceans before whaling began in earnest in the seventeenth century, the latest genetic estimates suggest the number may have been as high as 240 million animals.